This week, Amnesty International USA joined the New York State Comptroller, Thomas DiNapoli, in filing a shareholder resolution at Chevron Corporation. The resolution asks the company to appoint a board member with expertise in the impact on communities and the environment of its oil and gas extraction operations. For over a decade, Amnesty International USA has retained a small amount of Chevron stock and other corporations for the purpose of engaging in shareholder activism. Owning this stock allows Amnesty International USA to join with other shareholders in filing resolutions and speaking out at corporate annual shareholder meetings. Our shareholder activism has given us the opportunity to advocate for human rights with companies, including ExxonMobil, Yahoo, and Dow Chemical. Amnesty International USA has a long history of advocacy in support of the communities in Ecuador affected by Chevron’s oil pollution. For instance, in April 2006, Amnesty International USA joined a delegation of concerned shareholders and activists at the Chevron Corporation annual stockholder meeting in Houston, Texas, to demand the company address its human rights responsibilities in Ecuador’s Amazon and the Niger Delta. The delegation included Emergildo Criollo, a leader from the Cofan tribe in Ecuador. We know shareholder activism has an impact because corporations constantly try to shut it down. For instance, in 2012, Chevron went so far as to subpoena me, demanding all of my emails and documents concerning Amnesty International’s shareholder activism regarding Chevron. 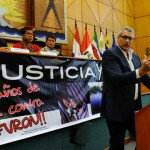 This subpoena was in connection with a retaliatory lawsuit brought by Chevron against the Ecuadorian villagers and their lawyers who successfully won a $9.5 billion judgment against Chevron for its oil pollution in the Ecuadorian Amazon. With its subpoenas, Chevron took aim at the advocacy work of Amnesty International, Amazon Watch, and Rainforest Action Network to try to shut it down. What Chevron management desperately wants to avoid admitting to its shareholders is the significant risk the company still faces due to legal actions against it in Canada to enforce the Ecuadorian judgment. When Chevron fled Ecuador, after the $9.5 billion judgement against it, the affected communities turned to the courts in Brazil, Argentina, and Canada, seeking the seizure of the assets of Chevron subsidiaries in order to pay for the Ecuador judgement. After an unanimous 2015 decision from Canada’s Supreme Court that gave a green light for the Ecuadorians to seek the seizure of Chevron’s assets in Canada, hearings were held in Ontario this past September. The principal issue now before the Canadian courts is whether to grant the Ecuadorian’s request for access to Chevron-Canada’s assets to cover Chevron Corp’s $9.5 billion debt, versus Chevron’s defense motion to summarily dismiss the entire claim. The Ecuadorians base their plea on the massive evidence of contamination in Ecuador and the $9.5 billion verdict issued in Ecuador and upheld by its highest court. Chevron claims the verdict itself is fraudulent, basing this claim on the fact that it managed to win its retaliatory RICO (racketeering) lawsuit in the US by alleging bribery, corruption, and a “ghostwritten” judgment by the Ecuadorian court. The problem for Chevron is that its key witness admitted to lying about that bribe and forensic evidence disproves its “ghostwriting” claims. Shareholders, in ever increasing numbers, are alarmed not only at Chevron’s willingness to abuse the law and attack its critics, but at the considerable waste of resources in fighting a case in which the company is so obviously culpable. Indeed, estimates of amount spent by Chevron to fight the Ecuadorian judgment, rather than simply clean up, have already reached over $2 billion. At Chevron’s annual shareholder meeting this past May, a significant number of Chevron shareholders expressed criticism of management. Shareholders voted 378,540,311 shares in support of a resolution that cited management’s mishandling of the case in Ecuador and called for tighter shareholder oversight. Put simply, Chevron management lost the confidence of shareholders holding nearly one third of its shares, valued at almost $38 billion. Chevron’s actions in this case have made the company renown worldwide as a bad corporate citizen and violator of both human rights and the environment. That is why the shareholder action brought by Amnesty International USA continues to be an important and effective part of human rights advocacy on behalf of the Ecuadorian villagers whose lives were destroyed by Chevron’s oil pollution. This entry was posted in Americas, Amnesty Members, Business and Human Rights, International Justice, Uncategorized by Simon Billenness. Bookmark the permalink. Ghost writing is the process of writing an article, book or anything else on behalf of another party – when the texts are officially credited to that other party. oreference is a solution of your all sodtware problem. Hang in there Simon! We are right behind you! Your Website is covered with many information's so, i would like to wish to visit your Website again and again any time. Thank you for sharing this kind of blog here. Really useful posts http://thetoprank.weebly.com/. I could collect more information from your post. Thank you! I think these activists should be supported if they are working for a good cause. Working for the growth of education in today's world is something that majority of us will not support. There are online services from like Dissertation Writing Help in UK that are creating an online platform where students can come and get their problems solved. On the other hand there are people who do not support this cause. my name is purushottam jha now iam doing diploma in subharti collage now i am in meerut nd i i think it's really verry nice city. i really verry exited nd doing fun with my friend pursottam now thank you very much.